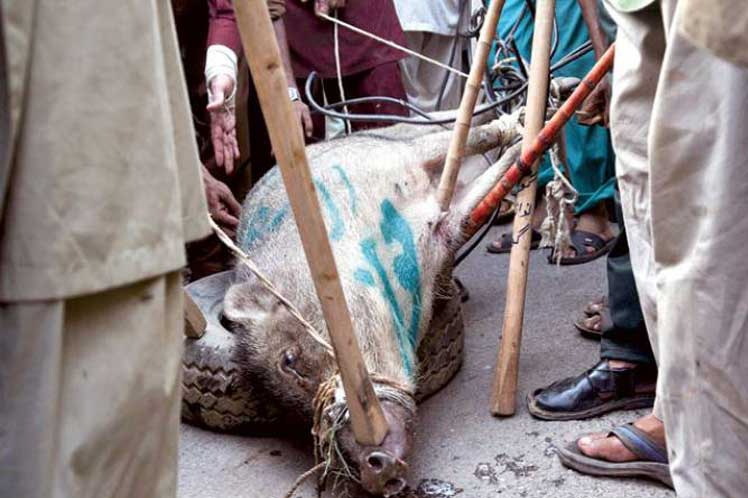 Pakistan Awami Tehreek (PAT) supporters on September 17, 2014 captured a wild boar outside the parliament house and subjected it to brutal torture. The angry protesting mob captured the boar outside the parliament building, beat it with sticks and stones and tied it down with cables and ropes. PAT protesters acted on their wrath by writing “go Nawaz go” on its body. The boar did not survive the torture and died amidst the cheers of the protesters. The wild boars roaming around the hills and roads in Islamabad is not a rare sight. Both boars and domestic pigs are considered unclean and unlawful animals in Islam and the violent act in a way represents protesters violent disgust for the PM Sharif and other rulers. PAT and Pakistan Tehreeke Insaf have been protesting outside the Parliament building at the Constitutional Avenue for a little over a month in a bid to change the regime. Social Networking website Twitter has been abuzzed with outrage at the incident. Shame on all those who committed this heinous cruel act. Qadri needs to teach his followers about animal rights as well.